Erythema dyschromicum perstans (EDP) is an uncommon, somewhat dubious cutaneous eruption of unknown etiology first described by Ramirez in 1957. Clinically, the condition is characterized by slowly progressive, symmetrical gray brown to blue gray macules, sometimes with an erythematous or elevated border, which is seen most commonly over the face, neck, trunk, and proximal arms. Although the condition has been widely described, especially in Latin Americans and Asians affecting all age groups and both sexes, but to the best of our knowledge, not a lone case has been reported during pregnancy so far. A 28-year-old primigravida presented with asymptomatic, slowly progressive diffuse darkening of the trunk, arms, dorsal hands, proximal thighs, and upper neck unfurling onto the jawline, appearing at 10–12 weeks of gestation. The lesions slowly extended peripherally becoming confluent and affected almost the whole body. There was no history of preceding dermatitis, itching or photosensitivity, and the use of any over-the-counter drugs, Oral Contraceptive Pills (OCPs), or herbal supplements. She denied contact with any new substance and starting any new activity prior to the onset of lesions. A full review of all systems revealed no abnormality. Systemic examination was normal. Cutaneous examination revealed confluent, symmetric ashy gray macules with polycyclic margins over the trunk, neck, face, upper limb, and proximal thighs [Figure 1] sparing the palms and soles. Most lesions displayed an elevated, erythematous, nonscaly border. Darier’s sign was negative. Hair, nails, and mucosae were spared. Complete blood count, liver and renal chemistry, thyroid profile, stool analysis for parasites, serology for human immunodeficiency virus (HIV) 1 and 2, and hepatitis B, C, antinuclear antibody assessments were unremarkable. A skin biopsy specimen from the pigmented macules on the right thigh divulged focal changes such as moderate compact hyperkeratosis, epidermal thinning, a vacuolar alteration of the basal layer with mild-to-moderate lymphohistiocytic infiltrate intermixed with melanophages in the upper dermis and the absence of colloid bodies [Figure 2]. The clinical and histopathological attributes were corroborative with the diagnosis of EDP. Since first described by Ramirez in El Salvador in 1957, EDP, also known as ashy dermatosis, has been a controversial entity. The terms EDP, ashy dermatosis, idiopathic eruptive macular pigmentation, and lichen planus pigmentosus (LPP) are often used interchangeably for various look-alike dermatoses. Sulzberger proposed the term “erythema dyschromicum perstans” while examining Convit’s patients with lesions similar to those described by Ramirez, sans the raised erythematous margins in the latter. The entity LPP introduced by Bhutani is characterized by hyperpigmented dark brown or slate gray macules distributed mostly over the exposed areas and flexures. There are exacerbations and remissions occasionally accompanied by pruritus. The lesions lack the erythematous border seen in EDP. The clinical association of this disorder with lesions of classical lichen planus and demonstration of colloid bodies on histopathology prompted the authors to coin a separate term LPP. They suggested that ashy dermatosis is similar to LPP, the former being a macular variant of the latter. Though several of the clinical and histologic features described in our case fit into LPP, a remarkable exception is that our patient had no preceding or concomitant lesions of lichen planus, a prominent raised erythematous border was seen, and colloid bodies could not be demonstrated on histopathology. Ashy dermatosis: Patients with idiopathic eruptive hyperpigmented macules, irrespective of the presence or absence of interfacial dermatitis histologically. EDP: Patients with lesions similar to those of ashy dermatosis, but who have or have had lesions with erythematous borders. 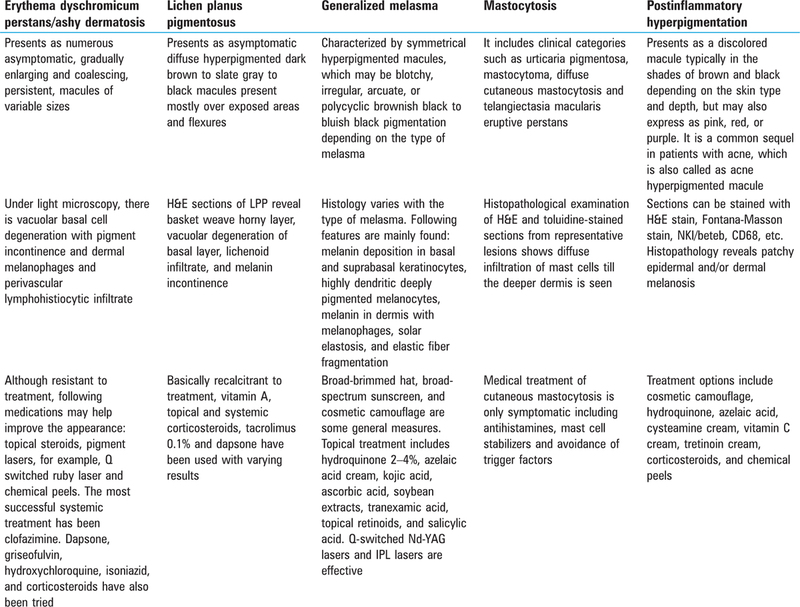 Simulators: Known dermatological diseases such as lichen planus, LPP, postinflammatory hyperpigmentation, generalized melasma, mastocytosis, and others [Table 1]. Clinically, this rare inflammatory skin disorder is characterized by asymptomatic, slowly progressing, ashy-gray, macular hyperpigmentation, symmetrically distributed on the trunk, the proximal aspects of the extremities, the neck, and face. The expanding macules have a slightly raised, erythematous border in the initial inflammatory stage, which is considered to be the hallmark of the disease. However, Chang et al. observed the peripheral erythematous borders only in 12 out of 68 (17.6%) patients with EDP. In most cases, the disease starts in adult life, but isolated cases and small series have been reported in children. The histopathology of EDP is not pathognomonic. The most relevant histopathological findings are a dermal perivascular lymphocytic infiltrate with numerous melanophages. Direct immunofluorescence microscopy studies have demonstrated colloid staining of IgM and C4, as well as the presence of fibrinogen at the dermoepidermal junction. Immunohistologic findings in EDP include keratinocytes having Ia antigen expression, strong OKT4 and OKT6 staining of Langerhans’ cells, and the dermal infiltrate of the helper/inducer and suppressor/cytotoxic phenotypes of T-cells. The treatment of EDP is largely unsatisfactory and remains a challenge. Overall, response to several therapeutic modalities including clofazimine and dapsone therapy is said to be variable or inconsistent. Lately, topical tarolimus has been found to be an effective and a safe therapeutic option. In our patient, other than sun avoidance, no other treatment was offered. The patient was later lost to follow-up. The case is highlighted because it is the first reported case of EDP occurring during pregnancy, which might further help us to elucidate the pathomechanism of this enigmatic disorder. Ramirez CO. The ashy dermatosis (erythema dyschromicum perstans): Epidemiological study and report of 139 cases. Cutis 1967;3:244-7. Ramirez CO. Los cenicientos: Problema Clinica. Memoria del Primer Congresso Centroamericano de Dermatologica; 1957. p. 122-30. Bhutani LK. Ashy dermatosis or lichen planus pigmentosus. What is in a name? Arch Dermatol 1986;122:133. Zaynoun S, Rubeiz N, Kibbi AG. Ashy dermatoses − A critical review of the literature and a proposed simplified clinical classification. Int J Dermatol 2008;47:542-4. 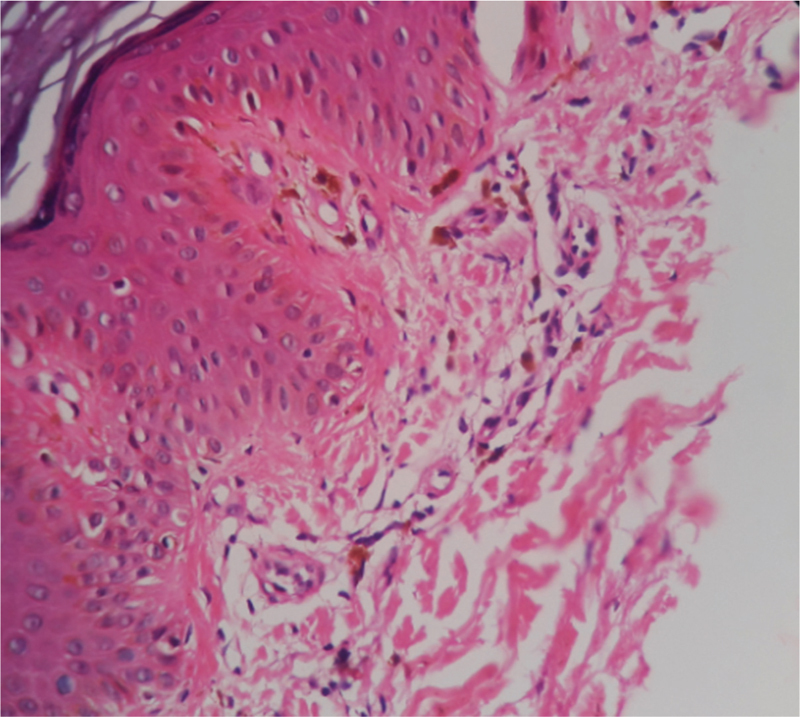 Keisham C, Sarkar R, Garg VK, Chugh S. Ashy dermatosis in an 8-year-old Indian child. Indian Dermatol Online J 2013;4:30-2. Torrelo A, Zaballos P, Colmenero I, Medioro IG, de Prada I, Zambrano A. Erythema dyschromicum perstans in children: A report of 14 cases. J Eur Acad Dermato Venereol 2005;19:422-6. Chang SE, Kim HW, Shin JM, Lee JH, Na JI, Roh MR et al. Clinical and histological aspect of erythema dyschromicum perstans in Korea: A review of 68 cases. J Dermatol 2015;42:1053-7. Mahajan VK, Chauhan PS, Mehta KS, Sharma AL. Erythema dyschromicum perstans: Response to topical tacrolimus. Indian J Dermatol 2015;60:525.